I think these are Luzon Point Headed Termites (Nasutitermus luzonicus). Found them inside the huge Singapore Botanical Gardens while doing a night macro session. They're infesting a small wooden post along a pathway. About three or four of these posts were all swarmed by these very tiny bugs. 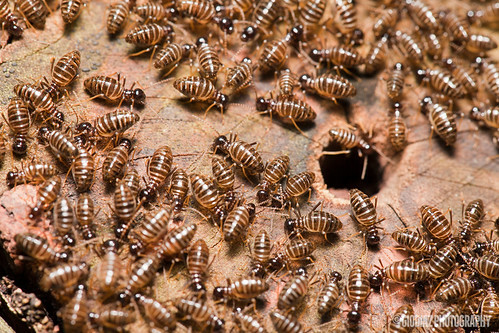 I just imagine that, from the picture above, that is your skin with a small gaping hole and a lot of these termites crawled in and out incessantly. Ugh, creepy idea! As someone here mentioned, up close they don't seem to have visible eyes or clues to where their eyes are. And it seems they don't have any visible mandibles. Looks like each one is a worker and no bigger ones that serve as soldiers or guardsmen.